Did this scene from Game of Throne inspire aliens to riot? 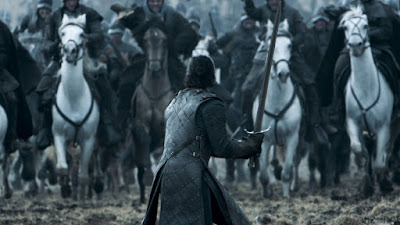 Warning: Spoilers for the Game of Thrones Episode: Battle of the Bastards. Over 100 aliens rioted at Clow UFO Base following the broadcast of the most recent Game of Thrones episode. Clow reports75 arrests and an undisclosed amount of damage to the base. According to some eyewitnesses, the violence began when some aliens started drinking goat cheese shakes. Eyewitnesses aren’t not sure if the riot started over an argument about why Rickon ran in a straight line as Ramsay shot arrows, or whether Yara Stark should marry Daenerys Targaryen. At some point, the fans started smashing windows and setting Segways on fire. Using a combination of riot foam and physical restraint by the Men in Blue, the Riot ended after 15 minutes. Several were injured, but there were no reported fatalities. A lawyer for one of the accused rioters vowed to get her client off on First Amendment grounds. Sources at Clow say they will allow for viewing parties of the season finale, but promise tighter security during the broadcast.